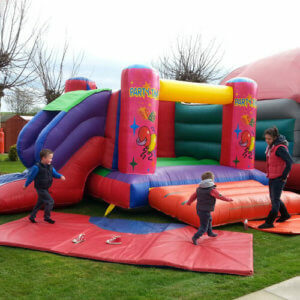 Happy Days Entertainment | Bouncy Castle Hire - Turn any party into a fantastic party for kids or adults! We have one of the largest choices of Bouncy Castle Hire anywhere in Newcastle or the North East. Happy Days create the best kids parties and the greatest children’s entertainment anywhere. We have the most amazing parties, rides, giant inflatable slides and bouncy castles for you to choose from. Our inflatables are designed for indoor and outdoor use (dependant on space and availability) and you can contact us if you have any questions at all. Your safety is our priority and our extensive insurance policy reflects this. Our equipment is safe and inspected regularly. We can provide staff to supervise our rides as part of any party package.